AdvoWaste is Florida's local alternative to professional, safe and reliable FL medical waste disposal services. We handle all types of biohazard waste and sharps removal for a wide variety of facilities in FL. Call us for a quick, hassle-free quote now at (786) 204-0876. See how Advo Medical Waste Disposal beats the competition in Florida. We guarantee to save you at least 30% off of your current local medical waste disposal service in Florida. We will provide you with an accurate price with a quick over the phone quote. 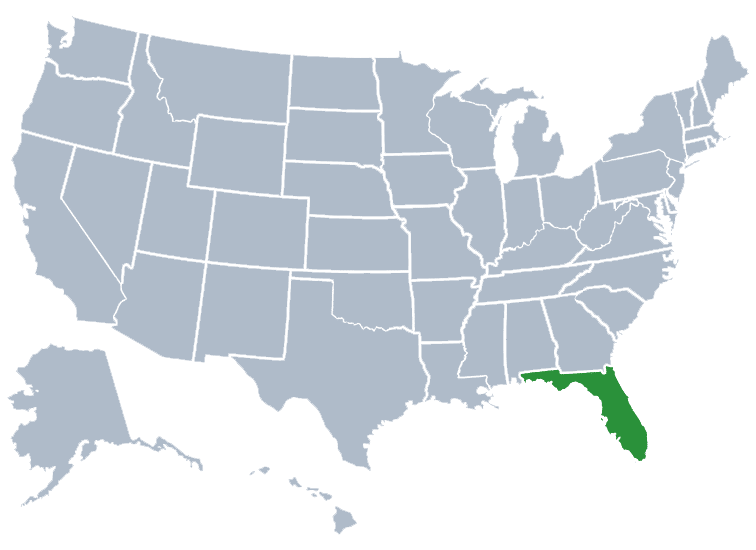 Florida is a southeastern state in the United States and is bordered by Alabama, Georgia and the Gulf of Mexico. It is the 3rd most populated state in the US and 8th most densely populated. The name Florida is spanish for “land of flowers” and was named by Spanish explorer Juan Ponce de Leon. Florida gained its statehood in 1845 and was heavily involved in the seminole wars against the native Americans. Florida is widely known as a vacation spot and retirement destination. Amusement parks such as Walt Disney World and Universal Studios, along with water parks, beaches and the Kennedy Space Center make Florida a popular destination. Even though Florida is called “The Sunshine State” severe weather is quite common. Central Florida experiences more lightning strikes than anywhere in the United States. Florida also has one of the the highest precipitation levels and leads the US in the most tornadoes per area. The largest metropolitan area in Florida is the Miami area with approximately 6.06 million people. Tampa Bay comes in second with roughly 3.02 million people and Orlando comes in at 3rd with over 2.44 million residents. In 2016, Florida’s Gross Domestic Product (GDP) was $926 billion, which ranks it as the 4ths largest economy in the US. The vast majority of it’s economy is driven by it’s 19 major metro areas, contributing a whopping 95.7% to the state of Florida’s economy. The highest populated cities in Florida are Jacksonville, Miami, Tampa, St Petersburg, Orlando, Hialeah, Tallahassee and Fort Lauderdale. Florida is the southernmost state in the nation, Florida is surrounded by the Atlantic Ocean on one side and the Gulf of Mexico on the other. With these two bodies of water, Florida offers hundreds of miles of beautiful beaches. With the amount of water, state specific animals such as the American alligator, American crocodile, Florida panther and mantee ca be found in the Everglades National Park in the southernmost part of the state. Besides Hawaii, Florida is next in line as the most tropical state in the nation and offers a climate for those that want to stay warm. A popular place for retirees, Florida is also home to one of the most popular amusement parks in the world- Walt Disney World which gets over 50 million visitors annually. If you are more interested in space, NASA developed the Kennedy Space Center in 1962 and has made Florida into a sizable aerospace industry. One thing is sure, Florida is known for its Latin cultural influences, especially among the Miami metropolitan area. Miami is known for its lavish nightclubs and beautiful beaches. It was a popular place for people seeking refuge from the communist government of Cuba. This was the beginning of its Latin cultural boom and has remained a huge influence to date. Jacksonville, Miami, Tampa, St. Petersburg, Orlando, Hialeah, Tallahassee, Fort Lauderdale, Port St. Lucie, Pembroke Pines, Cape Coral, Hollywood, Gainesville, Miramar, Coral Springs, Clearwater, Miami Gardens, Palm Bay, West Palm Beach, Pompano Beach, Lakeland, Davie Town, Miami Beach, Deltona, Plantation, Sunrise, Boca Raton, Largo, Melbourne, Palm Coast, Deerfield Beach, Boynton Beach and more FL medical waste service areas.